The North German Confederation, Norddeutscher Bund in German, came into being as a military alliance of 22 states of Northern Germany, with the Kingdom of Prussia as the leading state. The Confederation did not include Bavaria, Württemberg, Baden, Luxembourg, or Liechtenstein. Following the Austro-Prussian war of 1866, the alliance was formed into a federal state. This was the building block of the coming German Empire. One of the functions of the Confederation (Federation) was to handle the mails and issue postage stamps, which it began doing in 1868. This presented problems though, as the states of the Confederation had different monetary systems. 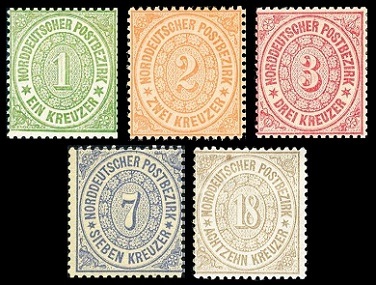 To accommodate the monetary systems of the member states, the Confederation stamps were separated into three groups, those for the Northern Postal District (in Groschen), those for the Southern Postal District (in Kreuzer), and those for Hamburg (in Schillings). The first North German Confederation stamps were issued on January 1, 1868. These first postage stamp issues were printed on white paper and rouletted 8 1/2 - 11 1/2. As with the rouletted issues of Prussia, the rouletting on these stamps is very irregular and sometimes incomplete. Thus, a stamp with uneven or missing rouletting on one or more sides is not necessarily faulty. 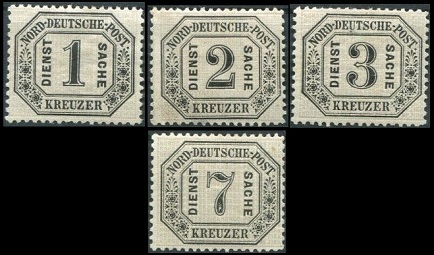 The Northern District stamps, denominated in Groschen (Mi. #1-6, Sc. #1-6), and the Southern District stamps, denominated in Kreuzer (Mi. #7-11, Sc. #7-11), are shown in the two images above. The rouletted Hamburg stamp issue will be presented later. The first perforated North German Confederation stamps were issued at the beginning of 1869. These postage stamp issues were printed on white paper and perforated 13 1/2 x 14 1/2. 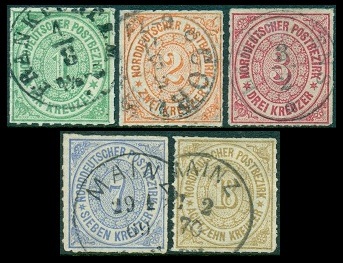 The Northern District stamps, denominated in Groschen (Mi. #13-18, Sc. #13-18), and the Southern District stamps, denominated in Kreuzer (Mi. #19-23, Sc. #19-23), are shown in the two images above. In 1868 and 1869, a special 1/2 Sch. stamp was also issued for Hamburg. 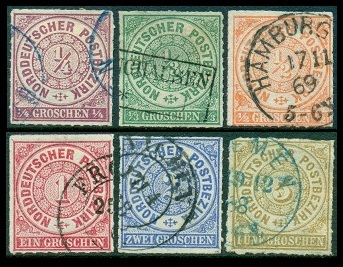 Although Hamburg had its own stamps, the stamps of the other two postal districts were also occasionally used there. Both the 1868 imperforate (Mi. #12, Sc. #12) and the 1869 perforated (Mi. #24, Sc. #24) stamps of Hamburg are shown in the image above. 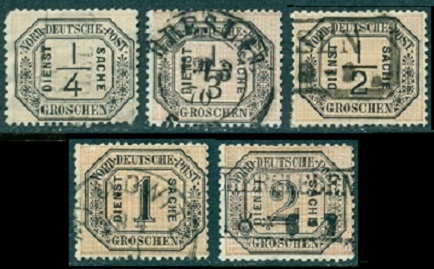 The 10 Groschen and 30 Groschen denomination stamps for the Northern District were issued in March 1869. They were printed on a paper similar to goldbeater's skin, to prevent the re-use of these high-denomination postage stamps. They are both shown in the image above (Mi. #25-26, Sc. #25-26). In 1870, official postage stamps were issued in both the Northern District and Southern District currencies. They are all shown in the two images above (Mi. Dienstmarken #1-9, Sc. #O1-9). 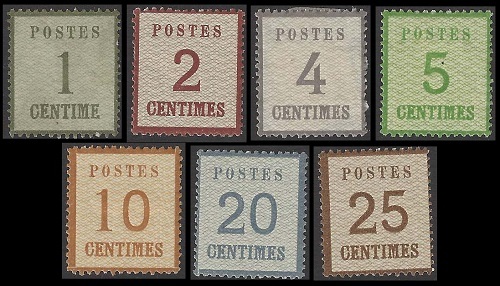 With the German occupation of the French departments of Alsace and Lorraine in 1870, new postage stamps were issued. They were issued in denominations from 1 Centime to 25 Centimes (French currency), which are shown above. Type I - shows the background pointing upward -- /\ /\ /\ /\ -- (Mi. #1I-7I, Sc. France #N1-7). Type II - shows the background pointing downward -- \/ \/ \/ \/ -- (Mi #1II-7II, Sc. France #N8-14). The second type is the scarcer of the two types. 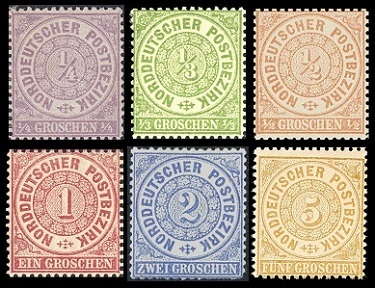 The North German Confederation postage stamps were replaced, in January 1872, by the first postage stamp issues of the German Empire.